The unnamed alternative reality version of Zoidberg living in the Cave of Hopelessness in Cornwood. 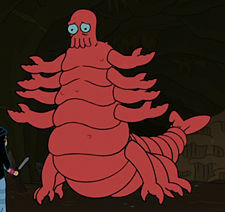 When the fellowship entered the Cave of Hopelessness, they mistook Zoidberg for the Tunneling Horror, so Leegola ripped out both of his hearts (eating one of them) and decapitated him, but when Zoidberg explained the Tunnelling Horror was another monster, Leegola realized she essentially killed an innocent creature and (temporarily) swore off violence. Later when Frydo went insane, Zoidberg's (still living) decapitated head convinced Frydo to destroy the Die, they arrived at the Geysers of Gygax, Momon caught them but Frydo was overwhelmed and Zoidberg made him drop the dice, which landed on 12 turning Frydo into a dragon. As Frydo and Momon fought, Zoidberg went to destroy the dice, but changed his mind because ultimate power sounded nice. 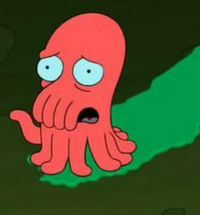 Just as he was celebrating, Greyfarn, just finding out he was Ignus' father, fell of the ledge, landing on Zoidberg. He dropped the Die which was retrieved by Momon, which caused everyone to fall into a large hole leading back to Earth. The ability to survive as a decapitated head. His head decreases in size when he is decapitated (however this is probably a goof). Testicles behind his neck (this may be the same as a normal Decapodian, as in "Why Must I Be a Crustacean in Love? ", Zoidberg says that Fry's gonads are in his neck). Two hearts instead of his original four. When killed, his head still somewhat survives, possibly meaning that he can live normally without his body. This page was last edited on 3 September 2014, at 12:45.